Turkey has taken a major step in tobacco control by passing an amendment to adopt plain packaging for all tobacco products effective as of 5 December 2018. Tobacco use is one of the biggest public health threats globally, killing more than 7 million people a year. According to the Turkish authorities, the diseases attributable to tobacco use cause more than 100 000 deaths in the country yearly. With the adoption of the amendment, Turkey joins a handful of countries who have implemented one of the WHO Framework Convention on Tobacco Control (WHO FCTC) key recommendations. According to the amendment, tobacco products shall be marketed “in plain and standard packaging” based on uniform design including brand typeface, font and size, pack colour, warning messages and other mandatory texts, phrases and images. The brand name will be written only on one side of the pack, covering no more than 5% of the side. No brand logo or symbol will be allowed in the new designs. The law also restricts advertisement outlets for tobacco products, and prohibits the display of consumption of such products on television, in films, on the internet and on publicly accessible social media platforms. 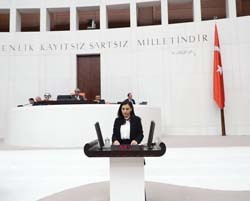 During her address to the Parliament in support of the amendment on 16 November 2018, Vice President of the Health, Family, Labour and Social Affairs Commission of the Grand National Assembly of Turkey Dr Müşerref Pervin Tuba Durgut underlined that a cigarette pack is the most basic communication and marketing tool for the tobacco industry. “Introduction of comprehensive bans on cigarette advertisements and sponsorship significantly reduces tobacco consumption rates and prevents the cigarette industry from reaching potential users, particularly children and young people,” she emphasized to the Parliament. Plain packaging reduces the appeal of tobacco products and helps eliminate misleading package designs that may suggest that some products are less harmful than others. Overall, plain packaging also increases the noticeability and effectiveness of health warnings on tobacco products. WHO provided technical assistance to the Health, Family, Labour and Social Affairs Commission of the Turkish Parliament and the Ministry of Health in drafting the amendment in line with guidelines under the WHO FCTC. Turkey has been a Party to the WHO FCTC since 2005.